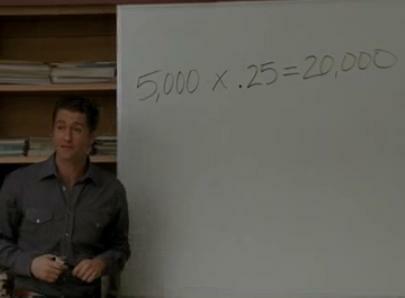 In a “Glee” return that almost ran like an episode of “American Idol”–three powerhouse performances received center-stage spotlight in the episode–the writers proved that while promoting arts education is a priority for the show, it is acceptable to overlook mathematics. Demonstrating his plan to sell salt water taffy to fund the New Directions’ trip to Nationals, Will wrote an equation on the board to determine how many pieces of taffy they needed to sell. Unfortunately, his math was blatantly off (and not mocked by any of the characters on the show, including the Academic Decathlon team, suggesting the error was not intentional). Noting that they needed to raise $5000, he calculated the number of taffy pieces required by the equation $5000 * .25c/piece = 20,000 pieces. The number of pieces he concluded was necessary was correct, but it was not the valid solution to his equation, which mistakenly used multiplication (the correct answer to the above is 1250). What the Will character wanted to do is divide $5000 by $.25/piece to concluded that the 20,000 pieces were necessary. Amber Riley tweeted that they all knew it was wrong earlier.